When the pros need an EQ, they turn to dbx. With a proven track record that spans four decades, dbx EQs are the industry standard for touring, studios, and audio installations. The dbx 231S Graphic Equalizer meets the needs of the most demanding sound reinforcement environments, while offering the simplicity of straightforward controls. 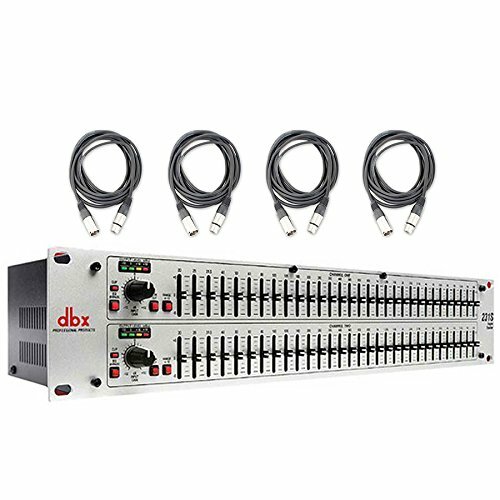 The dbx 231S includes two 31-band channels of 1/3-octave equalization, +/-12 dB input gain, switchable +/-6 dB or +/-12 dB boost/cut range, 20mm nonconductive sliders, an intuitive user interface, and output level metering. From its extended 10Hz to 50kHz frequency response and 112 dB dynamic range to the quality componentry and meticulous attention to detail, the 231S offers exceptional sound and rugged reliability that guarantees you will always sound your best. Sure to find a home in the studio, on tour and with installed sound venues, the dbx 231S is destined to take its rightful place in the lineage of great DBX signal processors that are the professional's choice in signal processing. With such affordable quality, there's no longer any excuse for compromising your sound. Bundle Includes 4 XLR Cables!